I am going to try my best to set aside time this week to write. My boys are playing nicely, all three have had their breakfast and my girls are still sleeping, so I am multi-tasking. I am attempting to eat my breakfast while I type. I hate multi-tasking and have never been good at it either. Hopefully my toast and egg whites won't get cold before I finish this. Last week was really stressful and today feels more like a Monday than a Tuesday. Last Monday evening we found out that a very close friend passed away unexpectedly. She was only 65. Judy was my mother-in-law's best friend and a big part of their family. In fact when my husband was growing up he and his sister called her Aunt Judy. I was shocked when I found out that she passed. Judy never got married and lived a very simple life. She worked as a teacher for a Lutheran elementary school until they had to let her go. For many years she stayed in rented rooms at other people's homes or took care of the elderly in exchange for room and board. She was a very caring and giving person and rarely ever spent money on herself. 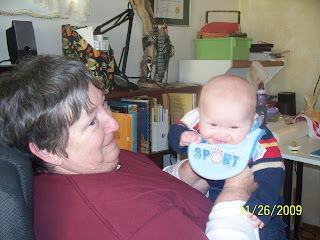 Judy was very passionate about teaching and loved the Lord and children. For a while she lived with my in-laws down in Sacramento, California. Whenever we traveled down to visit Judy was there and warmly greeted us with hugs and kisses. She is going to be missed by many, many people. Even though I was shocked to learn about Judy's death, my mother-in-law was not surprised. Apparently, she had this ongoing infection which caused her to get extremely high fevers. This sickness came and went for many months and often she would hide in her bedroom and wouldn't come out for nearly a week. Judy did not Judy did not have health insurance and was worried about receiving a doctor's bill, so she refused to seek medical care when she got sick. We still don't know what caused her high fevers. My mother-in-law learned to leave Judy alone when she got sick. She didn't want her to worry, or get bothered when she wasn't feeling well. The week that Judy died she was house sitting for a friend who was out of town. My mother-in-law got a phone call from her on a Thursday. Judy said that she was sick with a fever and was having a difficult time getting it to go down. After taking a shower she said she was going to try to relax on the recliner. The following Monday the home owner returned from vacation and found Judy unresponsive on the recliner. She called 911. When the fire-chief arrived he said that she appeared to have been dead for a couple of days. We believe that she died on Saturday July 20. The cause of death is still undetermined. On Thursday we piled the zoo into our van and made the 15 hour drive down to Sacramento to be with my in-laws. My mother-in-law was so happy that we were there. She really needed us. While we were down there, little Bear brought joy and laughter to all of us, which my sister-in-law caught on video. She was able to post it to facebook and we are still trying to figure out how I can add it to my YouTube channel. If you have the opportunity, this two minute video is well worth the watch (even though it is sideways it is still funny).